Give Your Bulletin Board a Heart! My kids dumped their backpacks in front like contaminated goods and ran to their iPads for a decompression session. It was the last day of school. The summer months beckoned with visions of sprinkler parks, road trips, summer camp games and lots and lots of popsicles. Homework was just a bad odor that lingered on their shoe. Their calendars were blank (or so they thought), relaxation was the primary focus and playtime was unlimited. Ironically, I looked at this hiatus as quite the opposite. My friend Jessica and I knew what summer had in store for us. We had planned to meet often over the next two months to do some serious brainstorming. As the newly appointed co-presidents, we had to create the vision and attempt to plan an entire year of PTA events. There was no stalling – we had to be ready. September was nobody’s friend! It was an exciting partnership but we each had our quirks. Specifically, she was not a fan of our PTA bulletin board – in the age of Twitter and Facebook, it had become stagnant and obsolete. It served little purpose, she insisted. I had to agree. Yet, I loved the creative potential it held. There must be some way we could make it more attractive, maybe even interactive! The bulletin board had to feel almost ALIVE, like an agent of our PTA, representing all that we stood for. It had to call out to people as they passed by!!! Jessica quickly removed the glass of wine from my spot on the table. Still, I couldn’t get the thoughts out of my head. It was a balmy August morning when a refreshing idea found its way to me like the sound of a can of cold, bubbly soda being opened on a hot, noisy plane. I was sitting at my computer, my phone in my ear and my fingers drawing funky designs with my newest pen. I closed my eyes for a moment while I listened. My friend Hope was on the other end of the phone, telling me about her workplace’s latest morale booster. I’ve been thinking about morale boosters lately. It’s a pity they don’t come in the form of a pleasant-smelling air freshener that you release in the area that needs it. Or the people who need it. That would solve every company’s personnel and productivity issues, right? And you can customize it to just the right formula for whatever results you want to achieve. Creative brainstorming meeting but structured at the same time? Kind customer service conversations but sticking to company refund policies? Hope continued her story about how the staff were encouraged to share random notes of appreciation with each other throughout the workweek. It seemed like a simple gesture at first. What made it effective was that it was encouraged but not mandatory. Co-workers felt special if someone wrote a thank you note or a ‘Kudos Card’ to them. There was no incentive to the writer of the note, other than the suspicion that they made someone smile in the cubicle down the hall. The soda mist fizzing around me was all in my head but the reality was undeniable. Hope had found the solution to our bulletin board problem. Why don’t we take that wonderfully sweet and simple idea and share it with the entire elementary school? Thus began our creation of the PTA’s Appreciation Station! 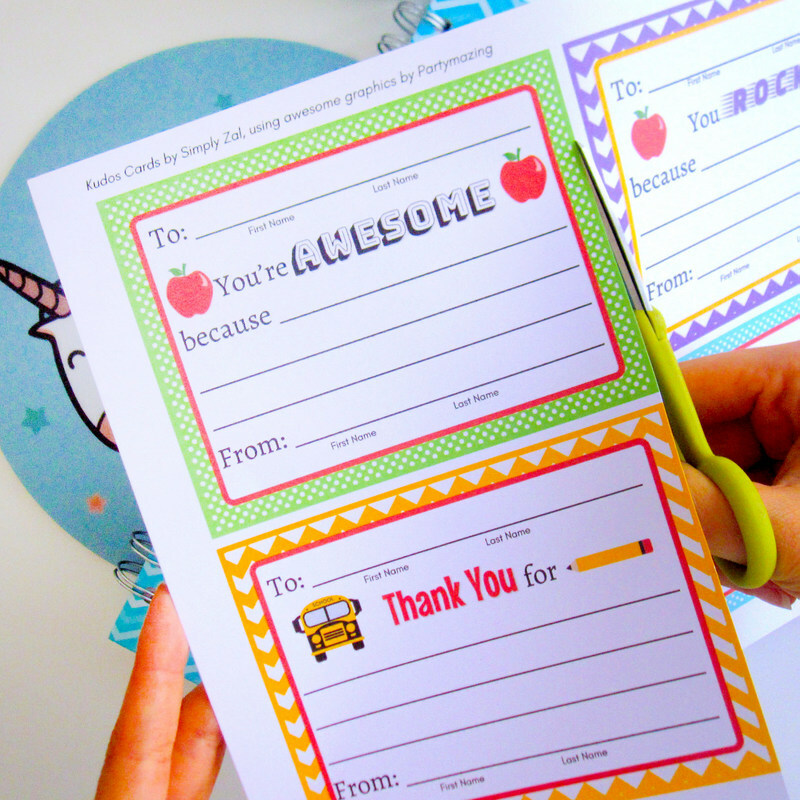 Anytime you feel like recognizing someone, grab a pre-printed ‘Kudos Card’ from the bulletin board. Staff, students, and parents could all part-take. 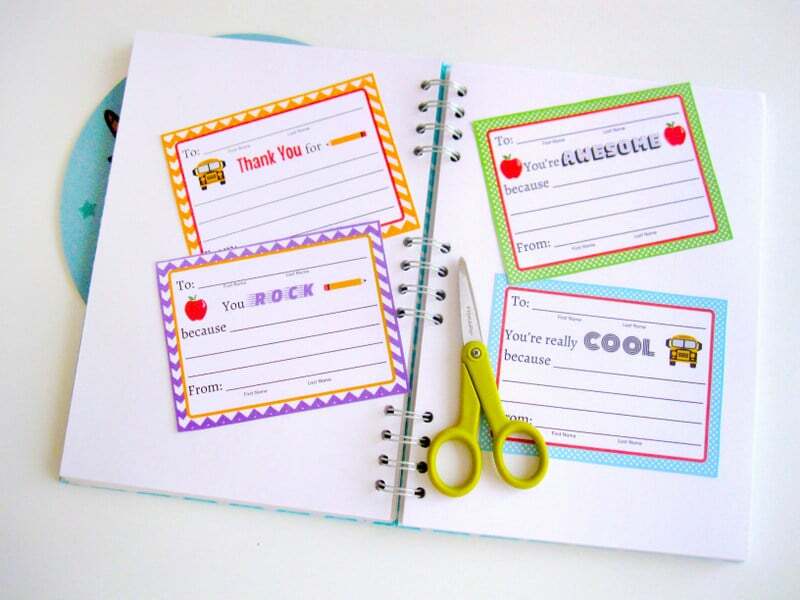 Make sure you address your special note to a specific person to brighten up their day, thank them for something or shine a light on something someone was doing that was absolutely amazing and note-worthy! Once we receive a set of cards, we happily display them on our bold, neon-colored bulletin board for all to see! What you’re looking at is the set-up on Day 1, with one of our lovely teachers, Ms. W., demonstrating how it works. My friend Francine graciously helped us with the Cricut lettering. I wish I had taken photos of it after the cards were actually posted on the board but you can use your imagination. The most interesting part happened when we set up a mini station in the school cafeteria. We didn’t know what kind of response we were going to get. A few weeks into the program, we were shocked that the elementary school students were not using the note cards in the way we thought. We had written out very specific instructions. And yet, that’s exactly what they did! No one tore them up, threw them in the garbage, or crushed them up and tossed them at each other. Not a single child wrote a silly or negative note and dropped it in the box. Every note was filled out with the sentiments we had hoped for. The students understood what we wanted and they seemed proud of every little note they wrote! The best notes were from one student to the other and some were very specific. It was endearing to see how highly they thought of their peers. Our bulletin board was a proud display of notes from teachers to other teachers, teachers to their student and vice versa and quite often, a note from children to one of their family members. We rotated the precious notes every few weeks and never ran out of notes to place on the board all year long. Would you like to start an Appreciation Station of your own? You don’t have to be a teacher or on the PTA. This uplifting project could be used in any group where there is a designated meeting space. 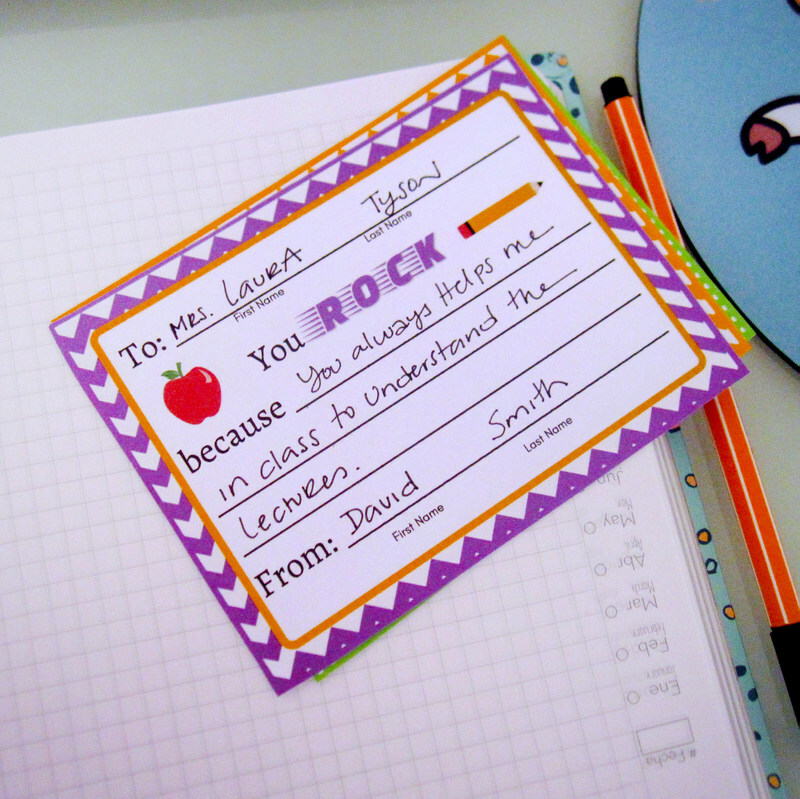 You can even do it virtually but there’s nothing sweeter than receiving a hand-written note! 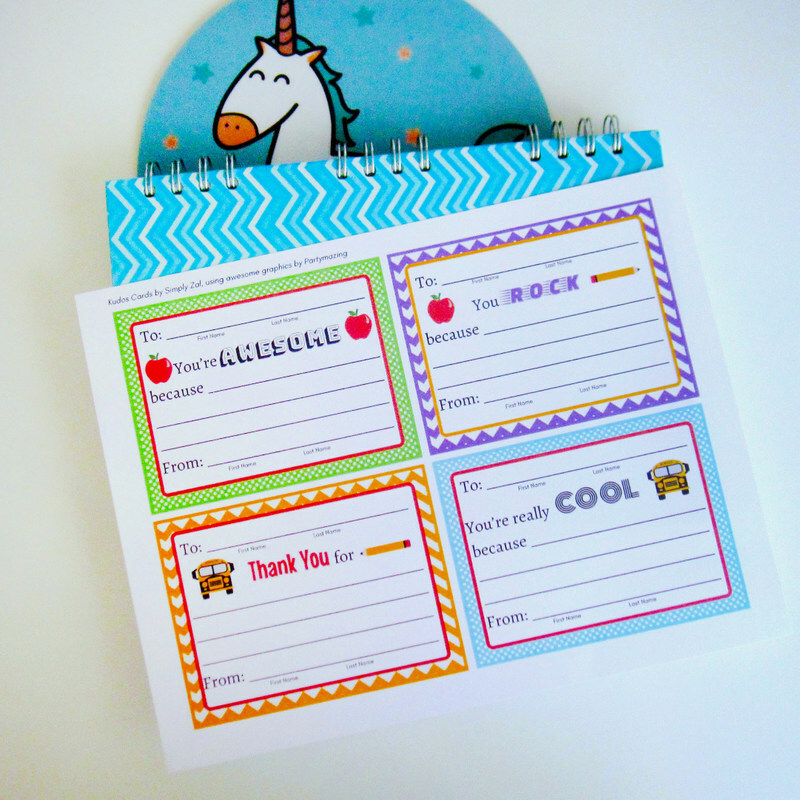 I’ve designed notes using some of Partymazing’s graphics and they are easy to print and photocopy. I would suggest that you print or copy onto different colored paper. Keep it fun and interesting. You will need a dedicated area for displaying your completed notes. It doesn’t have to be a bulletin board – you could even use an easel or trifold display board. Use what you have! Distribute a flyer or email or pass the word around about your new initiative. Decorate your main display station, e.g. the bulletin board, anyway you want. Make it eye-catching! Leave a lot of space in the middle for showcasing the completed cards. If you are working with a large population, establish card collection stations in various places. Make instructions clear and specific. 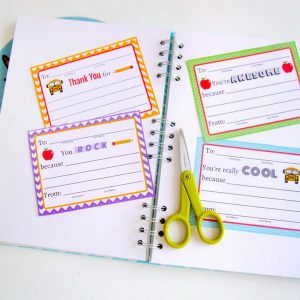 CLASSROOMS: The teachers would keep the blank cards in the classroom and the students could write one anytime they felt like it. We did not want it to become a mandatory class activity. Remember to replenish the supply of cards as needed. BULLETIN BOARD: Staff members could easily grab a blank card from the little envelopes at the bottom of the bulletin board if they wanted to write one themselves. SCHOOL CAFETERIA: We set up a caddy with blank cards and pencils and a collection box for students to drop the cards into. 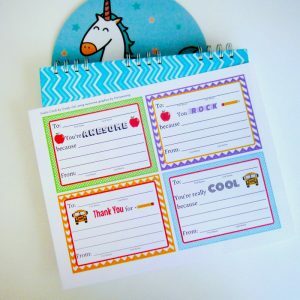 BACKPACKS: We also sent cards home to parents so they could participate or the students would have another means of writing the notes. We instructed the staff to drop the cards in our PTA mailbox. We also checked the collection box in the cafeteria regularly. Once we had checked those two places, we picked about 20 cards at a time and displayed them on our bulletin board. You may also want to give the cards to the ultimate recipients after they’ve had their turn on the board. It may seem like a lot of work at first glance but once you complete steps 1 through 5, all you do for the rest of the year is step 6. I hope you give this project a try and see how invigorating it can be for your entire group. If it doesn’t sound as refreshing as cracking open a fizzy soda pop, then picture breaking open a fresh water coconut and sticking a straw in it. Ah, that’s the feeling! Go for it!